Although independence dissolved the Philippines’ insular relationship with the United States, Romulo was not gone long, and he remained remarkably active on the international stage. In 1945 Romulo had told a House committee that everything changed with the advent of the atomic bomb. “The only permanent things are the intangible things—friendship, good will, faith, justice, right,” he said, stressing the need for a central global authority. “I have always believed that humanity is evolving into that goal—hemispheric solidarity; oceanic solidarity; federation and world government.”62 Fittingly, he twice served as ambassador to the United States (1952–1953 and 1955–1962), but he made his biggest mark in his work with the United Nations, which he helped charter. On July 9, 1946, the Philippine president appointed Romulo as the new republic’s permanent delegate to the United Nations. The former Resident Commissioner went on to serve as president of the UN General Assembly in 1949 and 1950. Late in his life, Romulo was criticized for supporting the dictatorial policies of Philippine President Ferdinand Marcos, but he never lost his fighting spirit. When the Soviet Union’s leading voice in the UN General Assembly called Romulo “just a little man from a little country,” Romulo admitted the delegate was correct about his physical stature and the size of his homeland. But, he said, “It is the duty of the little Davids here to fling pebbles of truth between the eyes of blustering Goliaths—and make them behave.”63 Romulo died in Manila on December 15, 1985. 1“Voice of Freedom,” 21 October 1941, New York Times: 16. 2Hearings before the House Committee on Ways and Means, Philippine Trade Act of 1945, 79th Cong., 1st sess. (17 October 1945): 111. 3Philippine Trade Act of 1945 (19 October 1945): 130. 4Parents’ names from Carlos P. Romulo, “I Walked With Heroes,” in The Romulo Reader, ed. Liana Romulo (Makati City, PI: Bookmark, Inc., 1998): 140–141. 5Romulo, “I Walked With Heroes”: 137–139, 144. 6Romulo, “I Saw the Fall of the Philippines,” in The Romulo Reader: 16–17; “Carlos Romulo, Was U.N. Founding Father,” 16 December 1985, Sun Sentinel (Fort Lauderdale, FL): B10. 7Romulo, “I Saw the Fall of the Philippines”: 19. 9Romulo, “I See the Philippines Rise,” in The Romulo Reader: 111; “Carlos Romulo, Was a U.N. Founding Father”; “Carlos P. Romulo, 86, One of the UN’s Founding Fathers,” 15 December 1985, Chicago Tribune: 18. 10Romulo, “My Brother Americans,” in The Romulo Reader: 35. 11Eric Pace, “Carlos Romulo of Philippines, a Founder of U.N. Dies at 86,” 15 December 1985, New York Times: 1; “Carlos Peña Romulo,” Biographical Directory of the United States Congress, 1774–Present, http://bioguide.congress.gov/scripts/biodisplay.pl?index=R000419. 13Romulo, “I Saw the Fall of the Philippines”: 12. 16Col. Carlos P. Romulo, “Col. C.P. Romulo Tells Story of Bataan’s Fall,” 28 February 1943, Chicago Tribune: 1; David M. Kennedy, Freedom From Fear: The American People in Depression and War, 1929–1945 (New York: Oxford University Press, 1999): 527–531. 17Romulo, “I See the Philippines Rise”: 93, 108. 18“Party Given for Colonel Romulo,” 30 October 1943, Washington Post: B3. 19“New Philippine President Reorganizes War Aides,” 11 August 1944, Atlanta Constitution: 11; “Osmeña Appoints His War Cabinet,” 11 August 1944, New York Times: 6; “Filipino Chief Reorganizes War Cabinet,” 11 August 1944, Washington Post: 5. 20“Filipinos Get Ready,” 12 August 1944, Washington Post: 4. 21Kennedy, Freedom from Fear: 822. 22Romulo, “I See the Philippines Rise”: 88. 24Congressional Record, House, 79th Cong., 1st sess. (24 September 1945): 8924. 25Philippine Trade Act of 1945 (17 October 1945): 113. See also Romulo, “I See the Philippines Rise”: 80–81. 26Romulo, “I See the Philippines Rise”: 102. 27House Committee on Insular Affairs, Establishing the Filipino Rehabilitation Commission, 78th Cong., 2nd sess., H. Rept. 1507 (23 May 1944): 2. The Filipino Rehabilitation Commission became law on June 29, 1944, as Public Law 78-381, 58 Stat. 626 (1944). 28Philippine Trade Act of 1945 (15 October 1945): 49. 30Congressional Record, House, 79th Cong., 1st sess. (24 September 1945): 8925. 31Philippine Trade Act of 1945 (17 October 1945): 116–117. 32Philippine Trade Act of 1945 (19 October 1945): 124. 33Philippine Trade Act of 1945 (15 October 1945): 52. 34Philippine Trade Act of 1945 (17 October 1945): 112. 35Congressional Record, House, 79th Cong., 2nd sess. (28 March 1946): 2753. 36House Ways and Means Committee, Philippine Trade Act of 1946, 79th Cong., 2nd sess., H. Rept. 1821 (26 March 1946): 5. 37Philippine Trade Act of 1946: 5. 39Congressional Record, House, 79th Cong., 2nd sess. (28 March 1946): 2754. 43Congressional Record, House, 79th Cong., 2nd sess. (29 March 1946): 2854. 46Hearings before the Senate Committee on Finance, Philippine Trade Act of 1946, 79th Cong., 2nd sess. (1946): 47–48, 141–142. 47Conference Committee, Philippine Trade Act of 1946, 79th Cong., 2nd sess., H. Rept. 1955 (17 April 1946); Public Law 79-371, 60 Stat. 141 (1946). 48Hearings before the Senate Committee on Territories and Insular Affairs, Philippine Rehabilitation Act of 1945 (30 October 1945): 143–144, 151. 49Senate Committee on Territories and Insular Affairs, Providing for the Rehabilitation of the Philippine Islands, 79th Cong., 1st sess., S. Rept. 755 (20 November 1945): quotation on p. 1, total damage estimates on p. 3. 50Congressional Record, Senate, 79th Cong., 1st sess. (5 December 1945): 11470. 51Congressional Record, House, 79th Cong., 1st sess. (18 December 1945): A5619; Congressional Record, House, 79th Cong., 2nd sess. (23 January 1946): 261. 52Hearings before the House Committee on Insular Affairs, To Provide for the Rehabilitation of the Philippine Islands, 79th Cong., 2nd sess. (2 March 1946): 121–122. 53House Committee on Insular Affairs, Providing for the Rehabilitation of the Philippines, 79th Cong., 2nd sess., H. Rept. 1921 (9 April 1946): 8. 54Ibid., 9; Congressional Record, House, 79th Cong., 2nd sess. (10 April 1946): 3438. 55Congressional Record, House, 79th Cong., 2nd sess. (10 April 1946): 3436. 58Conference Committee, Providing for the Rehabilitation of the Philippines, 79th Cong., 2nd sess., H. Rept. 1957 (17 April 1946); Congressional Record, House, 79th Cong., 2nd sess. (18 April 1946): 3987. The Philippine Rehabilitation Act of 1946 became law as Public Law 79-370, 60 Stat. 128 (1946). 59Congressional Record, House, 79th Cong., 2nd sess. (14 June 1946): 6967; Public Law 79-454, 60 Stat. 315 (1946). 60Congressional Record, House, 79th Cong., 2nd sess. (21 June 1946): 7319. 62Philippine Trade Act of 1945 (19 October 1945): 129. Andrade, Pio, Jr. The Fooling of America: The Untold Story of Carlos P. Romulo. N.p., 1990. 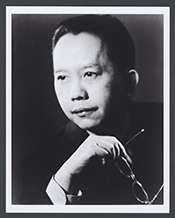 "Carlos Peña Romulo" in Asian and Pacific Islander Americans in Congress, 1900-2017. Prepared under the direction of the Committee on House Administration by the Office of the Historian and the Office of the Clerk, U.S. House of Representatives. Washington: Government Publishing Office, 2018. Romulo, Carlos Peña. I Walked With Heroes. New York: Holt Rinehart and Winston, 1961. ___. Forty Years: A Third World Soldier at the UN. New York: Greenwood Press, 1986. ___. The Romulo Reader. Makati City, Philippines: Bookmark, 1998. Romulo, Carlos P., and Beth Day Romulo. The Philippine Presidents: Memoirs of Carlos P. Romulo with Beth Day Romulo. Quezon City, Philippines: New Day Publishers, 1988. Spencer, Cornelia. Romulo: Voice of Freedom. New York: J. Day Co., 1953. Wells, Evelyn. Carlos P. Romulo: Voice of Freedom. New York: Funk and Wagnalls, 1964.